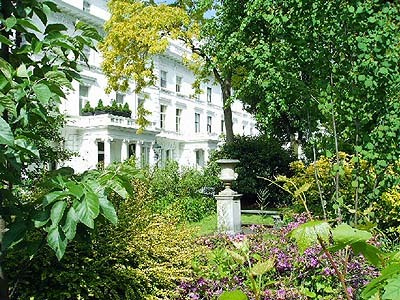 The private communal gardens were provided for residents of houses of Kensington Gate, which was developed in 1852 on the site of the old workhouse, demolished in 1849. The land was owned by the Trustees of the Campden Charities estate, one of the three estates in this area, the largest and also the first to be built on. The garden square has mature planes and ornamental trees and shrubs. Development of this area began before 1851. The land was owned by the Trustees of the Campden Charities estate, one of the three estates in this area, and also the largest and the first to be built on. The northern area of the estate was developed as Hyde Park Gate, to the south of which was the old workhouse of 1778, later the site of Kensington Gate. A development plan drawn up in 1810 by S P Cockerell attracted no interest from builders and was abandoned; in 1821 Thomas Drew produced a plan for four deep plots fronting onto Kensington Road behind a wide planted strip, with a road between the middle plots leading to a 'square' of eight further plots. This was hardly more successful although some building took place; the remainder of the estate was auctioned in 1828 and 1831, after which the present layout was established. In 1849 the workhouse was demolished and the site laid out by Inderwick and built as Kensington Gate in 1852. This was designed by architect A.C. Bean and the terraces form a remarkably homogeneous ensemble with Ionic porches and Italianate facades. The garden square with its mature planes, ornamental trees and shrubs provides a perfect setting for the houses. In 1928 the garden was described as 'a long narrow enclosure laid out as a lawn, with a privet hedge and some well-grown trees around the border.' It was provided for the use of the occupiers of the houses, who maintained it, while ownership remained with the Trustees of Campden Charities. An area outside the garden on the north corner of Palace Gate was recently re-landscaped as a formal paved area, a sculpture by Eilis O'Connell, and small trees.